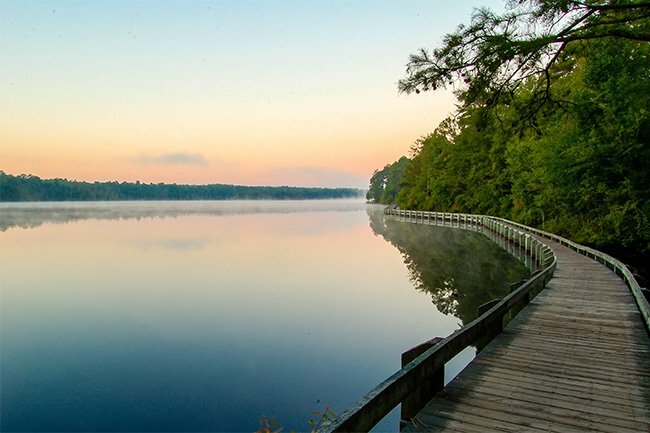 Known for its 18-hole championship golf course as well as its 360-acre Lake Juniper, Cheraw State Park has something to offer all lovers of the outdoors. 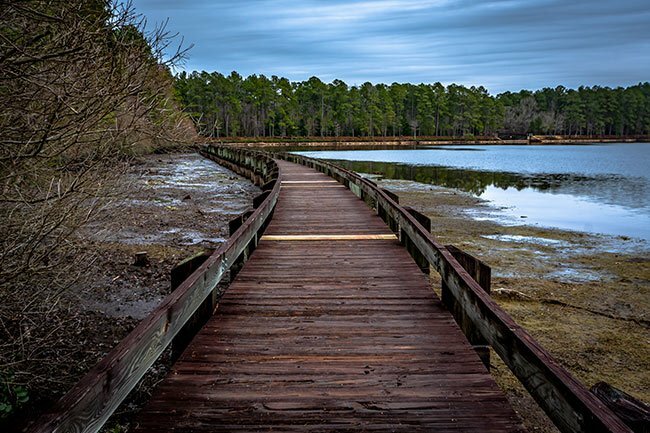 Like many South Carolina state parks, it was developed in the 1930s by the Civilian Conservation Corps (CCC), a work relief program established in 1933 by President Franklin Roosevelt as part of the New Deal. 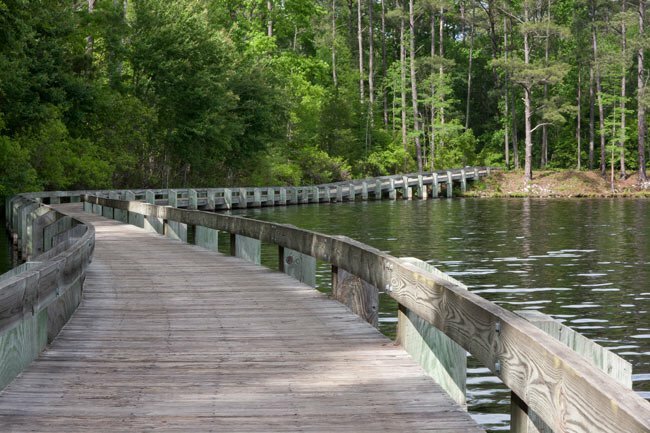 In fact, Cheraw State Park was the first state park proposed in the Palmetto State in 1934, though Myrtle Beach State Park was the first to open in 1936. The park is also one of two Recreational Demonstrations Areas (RDAs) in South Carolina (the other is Kings Mountain State Park). RDAs are parks created with overused, barren farmland purchased by the government during the Resettlement Administration in the 1930s. According to local history, children from the Cheraw area collected pennies for the development of the park, and the community contributed heavily towards the donations. 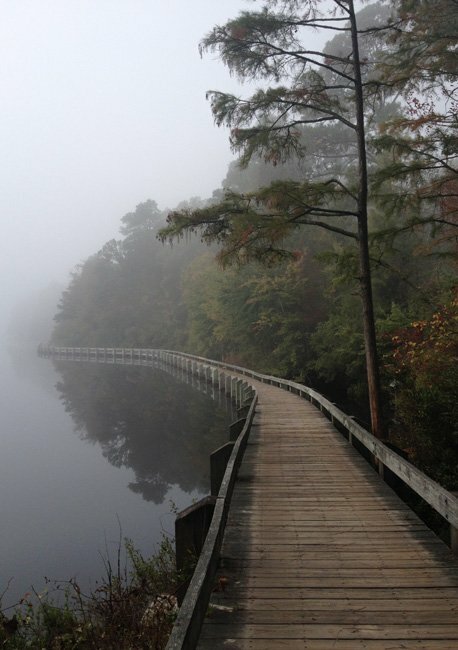 As a result the Town of Cheraw was able to purchase 700 acres for the park. By 1934, another 7,362 acres had been donated by local citizens and the federal government. The park sits near the Carolina Sandhills National Wildlife Refuge as well as the Sand Hills State Forest; all three sites are abundant in longleaf pines (Pinus palustris), which provide habitat to the federally-endangered red-cockaded woodpecker (Picoides borealis). The highlight of the park is Lake Juniper, one of the park’s first CCC projects. Though it is closed for swimming during the winter, other water activities are available, including boating and fishing with a license. 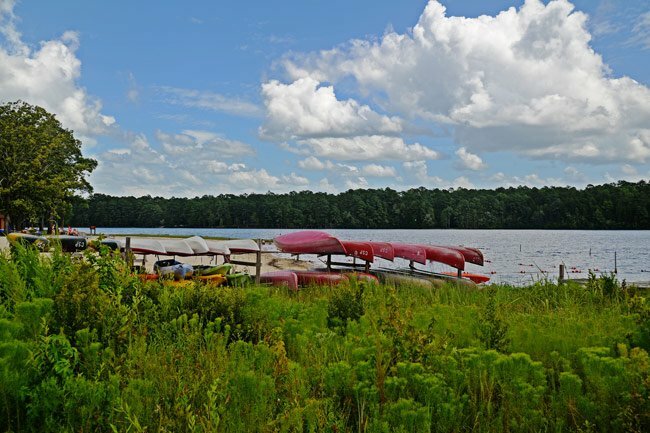 Canoes and kayaks can be rented for the day at the park, and private gasoline-powered boats up to 10 horsepower are permitted. Those paddling across the two-and-a-half mile lake and back can expect to be on the water for three or four hours. A Moonlight Canoe Float is hosted by the park once a month from March through October. A five-mile equestrian trail and camping facility are available for horse-lovers, and the four-and-a-half mile Turkey Oak Trail allows hikers to explore the park’s natural beauty, as does a nine-mile bike trail. Both regular campsites and cabins can be rented for those who need more than a day at this beloved state park. Within the park, Lake Juniper offers impressive wildlife viewing opportunities. 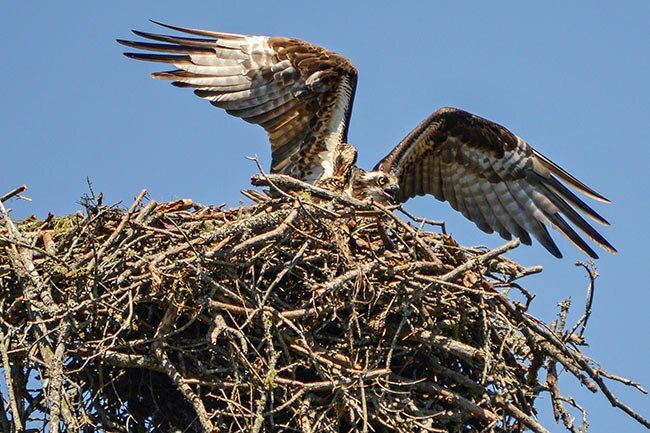 Seen here is a mother Osprey in the process of building a nest for her young. The diet of an Osprey consists almost entirely of fish, making this habitat a perfect one. Can you email some info on this camp? I have googled everywhere and can’t seem to find a history on it. My family walked through all of the old cabins today in Camp Juniper and Camp Forest and just wanted to find more info on the history. Until at least 1968 the park had several sets of army-brown cabins (4 or 5 maybe) circling a washhouse/toilet structure. The Methodist Church in N.C. called it “Camp Forest” and used it the summer of 1949. The camp covered a large area. I was 13 years old. It was a wonderful experience. At Evening Vespers on the sandy beach we were enormously impressed by a large cross set ablaze on an island at the swampy end of the lake. A real come-to-Jesus moment.